The Savute area of Chobe National Park is known for the now-dry Channel. Although water no longer flows, the water course has left an impressive bank, allowing for some excellent views. Savute Elephant Camp is on the bank of the channel, and overlooks a waterhole, which is particularly popular with elephants. The camp accommodates a total of 24 guests in 12 luxury ‘tents’, which have been placed under thatch. Each tent is on a slightly raised platform and has a private viewing deck, complete with hammock, overlooking the channel. Accommodation the beautifully appointed and is equipped with ceiling fan and air-conditioning, a mini-bar, small lounge area, and en suite bathrooms, which also boast and outdoor shower. Apart from the accommodation, the main lodge area (which houses the lounge and dining room), and large swimming pool all over the channel and waterhole – allowing for some excellent game and bird viewing. 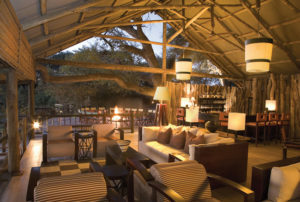 The Camp offers and additional dining experience in its Boma – an outdoor area, offering excellent views of the night sky. Dining in the Savute Boma will, without a doubt, bring you closer to nature within the heart of a true bush environment. As Savute Elephant Camp is situated within the National Park itself, game viewing is restricted to morning and afternoon game drives. 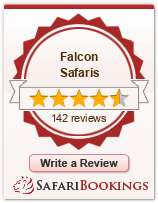 Game viewing is varied, and the Savute area is known for its predators, so lion, leopard, wild dog and cheetah are frequently encountered. There are also seasonal movements of large numbers of plains zebra. In addition, birding is excellent, particularly from December to March. The Savute area is also home to some small hills with harbour rare San Rock Art.